(Francisco Kjolseth | The Salt Lake Tribune) Utah Royals FC hosts Washington Spirit, NWSL soccer at Rio Tinto Stadium in Sandy, Wed. Aug. 8, 2018. Utah Royals FC forward Amy Rodriguez (8) takes a tumble while defended by Washington Spirit midfielder Tori Huster (23), losing part of her shoe, during the first half of the game. (Francisco Kjolseth | The Salt Lake Tribune) Utah Royals FC hosts Washington Spirit, NWSL soccer at Rio Tinto Stadium in Sandy, Wed. Aug. 8, 2018. Utah Royals FC forward Christen Press (21) ends up in a precarious place over Washington Spirit forward Mallory Eubanks (22) following a header in the first half of the game. (Francisco Kjolseth | The Salt Lake Tribune) Utah Royals FC hosts Washington Spirit, NWSL soccer at Rio Tinto Stadium in Sandy, Wed. Aug. 8, 2018. 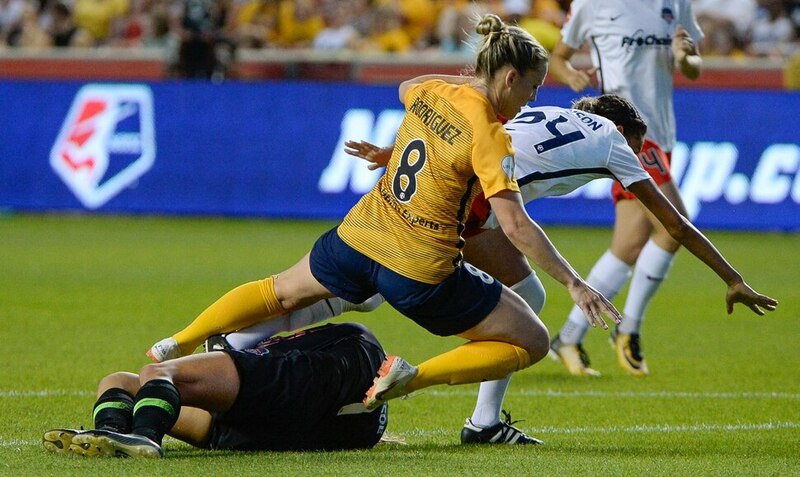 Utah Royals FC forward Amy Rodriguez (8) and Washington Spirit defender Estelle Johnson (24) avoid colliding with Washington Spirit goalkeeper Aubrey Bledsoe (1). (Francisco Kjolseth | The Salt Lake Tribune) Utah Royals FC hosts Washington Spirit, NWSL soccer at Rio Tinto Stadium in Sandy, Wed. Aug. 8, 2018. Utah Royals FC forward Christen Press (21) ends up in a precarious place over Washington Spirit forward Mallory Eubanks (22) following a header in the first half of the game. (Francisco Kjolseth | The Salt Lake Tribune) Utah Royals FC hosts Washington Spirit, NWSL soccer at Rio Tinto Stadium in Sandy, Wed. Aug. 8, 2018. Utah Royals FC forward Katie Stengel (24) is blocked by Washington Spirit midfielder Tori Huster (23) during a drive against Washington Spirit goalkeeper Aubrey Bledsoe (1). (Francisco Kjolseth | The Salt Lake Tribune) Utah Royals FC hosts Washington Spirit, NWSL soccer at Rio Tinto Stadium in Sandy, Wed. Aug. 8, 2018. Utah Royals FC forward Christen Press (21) ends up in a precarious place over Washington Spirit forward Mallory Eubanks (22) following a header in the first half of the game. (Francisco Kjolseth | The Salt Lake Tribune) Utah Royals FC hosts Washington Spirit, NWSL soccer at Rio Tinto Stadium in Sandy, Wed. Aug. 8, 2018. Utah Royals FC midfielder Lo'eau LaBonta (9) tries to regain control of the ball during a downfield drive. (Francisco Kjolseth | The Salt Lake Tribune) Utah Royals FC hosts Washington Spirit, NWSL soccer at Rio Tinto Stadium in Sandy, Wed. Aug. 8, 2018. Utah Royals FC forward Katie Stengel (24) collides with Washington Spirit forward Mallory Eubanks (22) following a header attempt in the first half of the game. (Francisco Kjolseth | The Salt Lake Tribune) Utah Royals FC hosts Washington Spirit, NWSL soccer at Rio Tinto Stadium in Sandy, Wed. Aug. 8, 2018. Utah Royals FC midfielder Erika Tymrak (15) tries to get past Spirit defenders in the first half of the game. (Francisco Kjolseth | The Salt Lake Tribune) Utah Royals FC hosts Washington Spirit, NWSL soccer at Rio Tinto Stadium in Sandy, Wed. Aug. 8, 2018. Utah Royals FC forward Amy Rodriguez (8) takes a tumble while defended by Washington Spirit midfielder Tori Huster (23), losing part of her shoe, during the first half of the game. (Francisco Kjolseth | The Salt Lake Tribune) Utah Royals FC hosts Washington Spirit, NWSL soccer at Rio Tinto Stadium in Sandy, Wed. Aug. 8, 2018. Utah Royals FC forward Amy Rodriguez (8) tries to get past Washington Spirit midfielder Tori Huster (23), losing part of her shoe, during the first half of the game. (Francisco Kjolseth | The Salt Lake Tribune) Utah Royals FC hosts Washington Spirit, NWSL soccer at Rio Tinto Stadium in Sandy, Wed. Aug. 8, 2018. Utah Royals FC forward Katie Stengel (24) collides with Washington Spirit forward Mallory Eubanks (22) following a header attempt in the first half of the game. (Francisco Kjolseth | The Salt Lake Tribune) Utah Royals FC hosts Washington Spirit, NWSL soccer at Rio Tinto Stadium in Sandy, Wed. Aug. 8, 2018. Washington Spirit goalkeeper Aubrey Bledsoe (1) finds an open teammate in the first half of the game. (Francisco Kjolseth | The Salt Lake Tribune) Utah Royals FC hosts Washington Spirit, NWSL soccer at Rio Tinto Stadium in Sandy, Wed. Aug. 8, 2018. 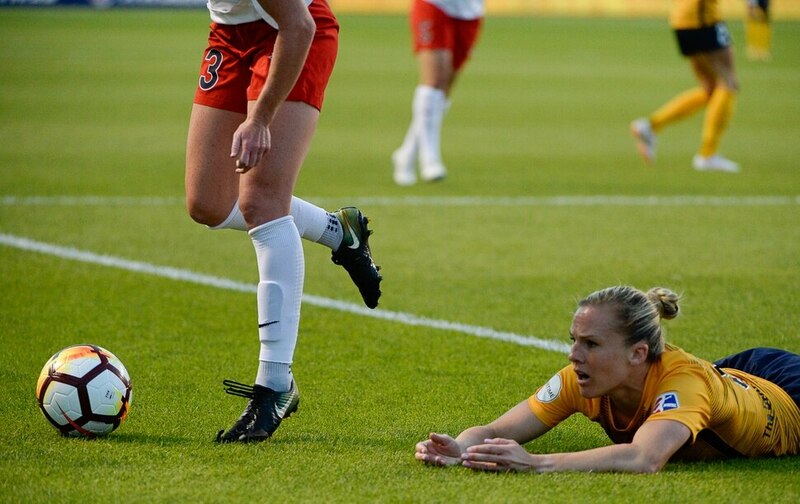 Utah Royals FC forward Amy Rodriguez (8) takes a tumble while defended by Washington Spirit midfielder Tori Huster (23), losing part of her shoe, during the first half of the game. (Francisco Kjolseth | The Salt Lake Tribune) Utah Royals FC hosts Washington Spirit, NWSL soccer at Rio Tinto Stadium in Sandy, Wed. Aug. 8, 2018. Utah Royals FC forward Katie Stengel (24) is blocked by Washington Spirit midfielder Tori Huster (23) during a drive against Washington Spirit goalkeeper Aubrey Bledsoe (1). (Francisco Kjolseth | The Salt Lake Tribune) Utah Royals FC hosts Washington Spirit, NWSL soccer at Rio Tinto Stadium in Sandy, Wed. Aug. 8, 2018. Utah Royals FC defender Becca Moros (3) goes up for a header ahead of Washington Spirit forward Cali Farquharson (17). (Francisco Kjolseth | The Salt Lake Tribune) Utah Royals FC hosts Washington Spirit, NWSL soccer at Rio Tinto Stadium in Sandy, Wed. Aug. 8, 2018. Utah Royals FC midfielder Erika Tymrak (15) tried to head one in to the goal past Washington Spirit defender Rebecca Quinn (4). (Francisco Kjolseth | The Salt Lake Tribune) Utah Royals FC hosts Washington Spirit, NWSL soccer at Rio Tinto Stadium in Sandy, Wed. Aug. 8, 2018. Washington Spirit goalkeeper Aubrey Bledsoe (1) launches a midfield shot during the first half of the game. (Francisco Kjolseth | The Salt Lake Tribune) Utah Royals FC hosts Washington Spirit, NWSL soccer at Rio Tinto Stadium in Sandy, Wed. Aug. 8, 2018. Utah Royals FC defender Sydney Miramontez (17) lets it rip in the first half during a drive on the goal. (Francisco Kjolseth | The Salt Lake Tribune) Utah Royals FC hosts Washington Spirit, NWSL soccer at Rio Tinto Stadium in Sandy, Wed. Aug. 8, 2018. Utah Royals FC forward Katie Stengel (24) is celebrated by teammates after scoring the winning goal over Washington Spirit for a final 1-0 score. (Francisco Kjolseth | The Salt Lake Tribune) Utah Royals FC hosts Washington Spirit, NWSL soccer at Rio Tinto Stadium in Sandy, Wed. Aug. 8, 2018. The Royals clap along with the fans after their 1-0 win. (Francisco Kjolseth | The Salt Lake Tribune) Utah Royals FC hosts Washington Spirit, NWSL soccer at Rio Tinto Stadium in Sandy, Wed. Aug. 8, 2018. Utah Royals FC forward Katie Stengel (24) is celebrated as the player of the game after her winning goal 1-0. (Francisco Kjolseth | The Salt Lake Tribune) Utah Royals FC hosts Washington Spirit, NWSL soccer at Rio Tinto Stadium in Sandy, Wed. Aug. 8, 2018. 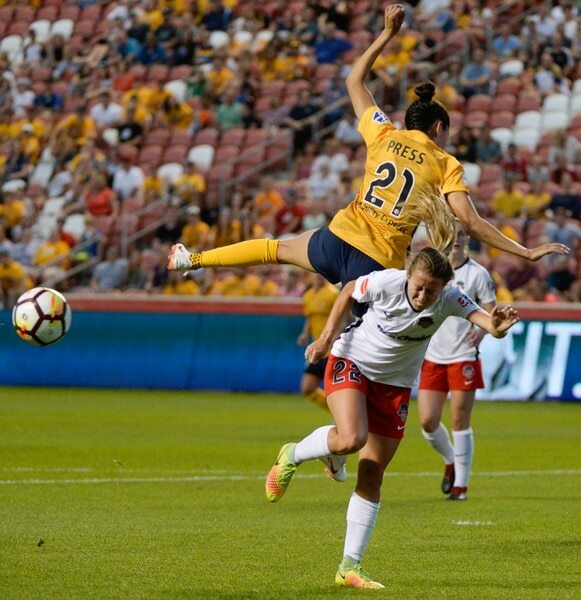 Utah Royals FC midfielder Lo'eau LaBonta (9) jumps on Utah Royals FC forward Katie Stengel (24) after Stegel's goal in the final minutes of the game. (Francisco Kjolseth | The Salt Lake Tribune) Utah Royals FC hosts Washington Spirit, NWSL soccer at Rio Tinto Stadium in Sandy, Wed. Aug. 8, 2018. The Royals gather following their 1-0 win. Need a winning goal? Find Katie Stengel. In a match many around the squad called a “must-win,” Stengel stepped to the forefront in the final 20 minutes to score a winner, keeping the Utah Royals in the NWSL playoff hunt with a 1-0 win over the Washington Spirit at Rio Tinto Stadium on Wednesday night. It was her second winning goal in four days, having found the net against the Houston Dash in the 83rd minute on Sunday. Stengel came to the rescue of a Utah side that was having trouble finding the net. Utah outshot Washington 18-3 overall, with eight Royals shots on goal. “We’ve won, but we’re frustrated because we could have won it by a lot more,” Royals coach Laura Harvey said. But the lack of goals couldn’t be chalked up to a lack of effort from Harvey, who played her attacking cards in the starting lineup. Stengel, traditionally a striker, played on the wing, giving Amy Rodriguez room to attack centrally. Midseason acquisition Christen Press started in central midfield, while Erika Tymrak was in the starting lineup opposite Stengel. It was nearly all of the Royals’ attacking options in one unit. It was substitutes Taylor Lytle and Diana Matheson who ended up finding Stengel on the goal. On her first assist of the season, and in only her sixth match, Lytle played a ball to Matheson, who was aware of Stengel behind her and dummied the ball through her legs to allow Stengel to twist and fire in the right-footed shot. Stengel leads the Royals on the season with five goals, three more than anyone else. The win was crucial to the Royals’ playoff chances. The Royals are tied for fifth in the NWSL with Chicago and are one point out of the fourth and final playoff spot, currently held by the Portland Thorns. The Royals have played one more match than Portland, and two more than Chicago. The Royals would also lose head-to-head tiebreakers with either squad. The Royals’ remaining schedule, though, is considerably more favorable. The Royals have two matches left against Washington and Sky Blue FC, teams that have a combined 2-27-8 record. The Royals play again on Saturday at 1:30 p.m. against Seattle.